Spend time in the Kansas countryside and you’ll often see these gorgeous white birds, cattle egrets, walking around in pastures. They’re around 20-inches tall, walk on spindly legs and are often wearing long, ornamental feathers that blow in the breeze. During the spring breeding season many are adorned with orangish-brown highlights a top their head and on their breast. Oh, and you’ll often see them near cattle. 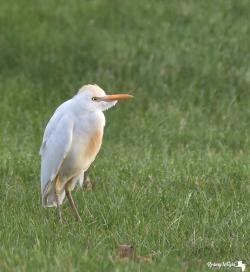 As their name implies, most places in the world with cattle now have cattle egrets. It wasn’t always so. For centuries they were mostly confined to Africa. Then around 1870 cattle egrets crossed the Atlantic and made an appearance on the new cattle ranches in South America. By the 1950s they’d made their way into North America. They’re also in Australia, and began nesting in the United Kingdom about 15 years ago. Cattle egrets seem to prefer pastures near wetland areas yet are seldom seen wading, like native snowy and great egrets. They feed heavily on insects, often picked from the backs of cattle. They are opportunists and will eat reptiles and small amphibians. They will also take hatchlings from the nests of other egrets and herons where they share nesting areas.